What can P65 buy you these days? A loaf of bread, 1 big bottle of soda, a liter and a half of gas? Not much really BUT at Jollibee's The Big Fun Event, your P65 can go a long way. 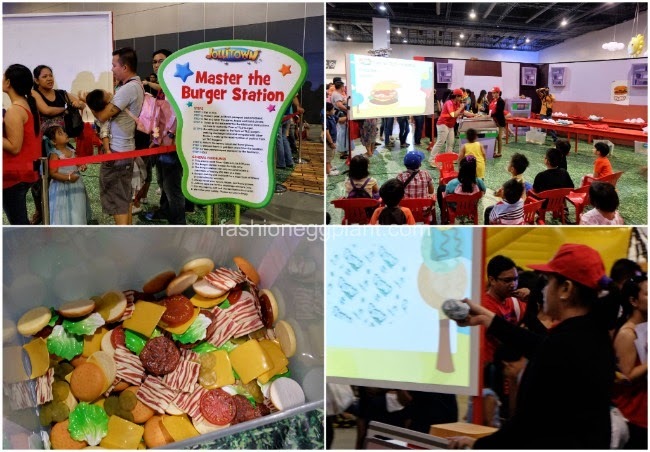 The Big Fun Event was exclusive to Jollibee Kids Club Members but non-members could still enter by simply applying for membership at the venue. Entrance cost only P65 per head and that already included stubs for a meal, a lootbag, and an unlimited pass so you and your kids can enjoy all the activity booths prepared inside by Jollibee! The venue was filled with endless giant inflatables so the kids could have fun and not get hurt. There was a giant rainbow slide, a mock rock climbing booth, a graffiti art wall where they could just go crazy and paint whatever they wanted, a hat booth where you could get free hats in your favorite Jollibee mascot, a wishing well, a velcro wall, bubble dome (we all know how much kids love their bubbles! ), a master burger station and many, many more. Best of all? After completing each activity, your kids get a stamp on their Jollitown Passport which allows them to redeem special prizes at every booth! They don't call it The Big Fun Event for nothing! Everyone had a good time and this was a very common scene along the sidelines: kids sitting down, having a mini picnic while playing with the news toys they got from every booth. All of the kids left with lootbags filled to the brim! Me? I was just happy with my free Yum and the fact that I was able to let my daughter have such a good time while spending very little cash. We arrived home with happy bellies and more than enough toys to keep her busy for a week! One whole day certainly wasn't enough. There were so many things we still wanted to try. Hoping they have another one next year and that they make it last a bit longer! See you at the next Jollibee event! Thanks for having us, we look forward to the next! I think anything you wear will look good on you. Honestly! Even the simplest outfits you put on looks fasyown hehe. Gosh, even a pair of birks looks good on you, I wouldn't be able to pull those of in a million years.